What is in The Book of Henry? UK: Thursday 5th May 2016 – Paul Fegan’s first feature documentary follows Scottish cult-pop raconteur and former Arab Strap frontman Aidan Moffat as he tours Scotland in 2014, performing his modern re-interpretations of old folk songs. It was meant to be a tour that celebrated communities and lore. But just before they hit the road, Fegan met Sheila Stewart: a 79-year-old force of nature, the last in a line of travelling folk royalty, and a balladeer whose life – and unexpected death, in 2014 – upturned Moffat’s folk assumptions, and diverted the course of Fegan’s film. The ensuing film is a warm-hearted journey through music, mortality, landscape and time. It’s also a moving, wry and enlightening depiction of two of Scotland’s most distinct and vital voices, as they cross paths (and words): Moffat believes Scotland’s oldest songs are ripe for re-working against a contemporary urban backdrop. Stewart does not. The cinema tour will kick off with a full band performance from Moffat and the musical stars of the film, including James Graham (The Twilight Sad), Jenny Reeves (Bdy_Prts), Stevie Jones (Sound of Yell), Michael John McCarthy, and traditional bothy ballad singers Joe Aitken, Geordie Murison & Danny Couper – at Sheffield Doc/Fest on 12th June. The event tour that follows will take the film to 18 cities and towns throughout the UK where screenings will be followed by a Q&A with director and producer Paul Fegan and a solo performance by Aidan Moffat. 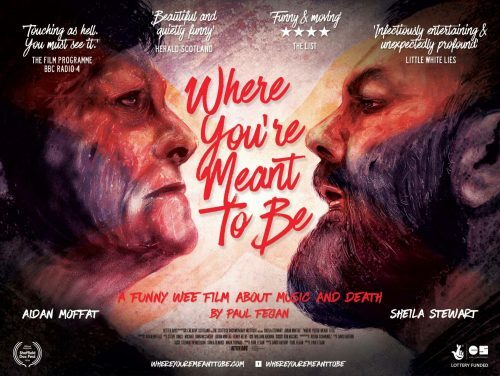 WHERE YOU’RE MEANT TO BE will be screening in 40 cinemas from 17 June, for full listings go to whereyouremeanttobe.com. The film will be available on iTunes 1 July 2016.